Since May the 30th this year, the rules governing what you can build onto your house without planning permission have changed. For a three year period, householders can make single storey rear extensions under permitted development rules twice the normal size. So for a terrace, you can extend back 6 metres, not 3, and for detached house you can go back 8 metres, not 4. That’s a lot of extension. In fact I expect very few people to go that far – more building means more money and as the house extends the inner parts of the house get further from the daylight and fresh air. I wrote about changes to permitted development back in June and since then I have been looking for a job to try it out on. I worked on this scheme last year without being able to satisfy the planning officer or the client and now the rules have changed we will try again. I spoke to the planning officer and sent off this site plan, let’s see what comes back. If you want to apply for Permitted Development – Larger Extensions here’s what to do: Fill in a form like this one and send it off together with a site location plan at 1:1250 (showing the direction of north, the names of two streets and the site outlined in red) and a site plan at 1:200 showing the proposed extension. 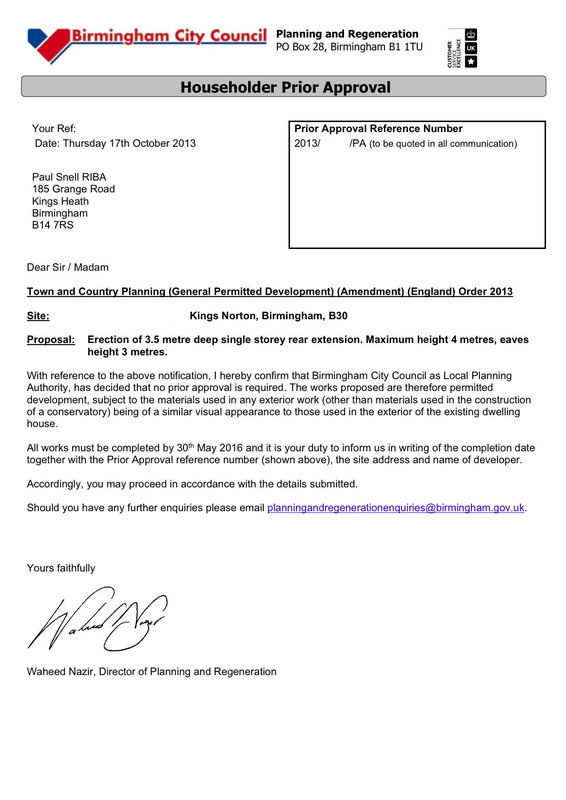 Make sure you send it to your local authority directly, not to the planning portal – that is for planning permission only, but it has tons of useful information. Seems like a lot of information? You can get in touch with me right here and get some help with it all. Although the six or eight metre allowance seems like a free-for-all, bear in mind that there are some significant restrictions to permitted development – it does not apply in Conservation Areas, like Moseley Conservation Area, or if your home is special enough to be listed. There are also restrictions on height, width, proximity to boundary, materials and overall size in relation to curtilage (the vacant land around your house). There are also special rules about the geometry of your extension if your house has a projecting wing at the rear – likely to be the narrow kitchen if your house is a Kings Heath terrace. Birmingham City Council have a pretty tough line on rear extensions that try to fill in between the kitchen wing and the back living room, but permitted development lets people “get around” this prohibition because planning permission is not required. So for client’s looking for a kitchen that is the full width of their house, PD can give a legal route to build. In the case of this project on Grange Road, the client was looking for just this arrangement, and to have the side return extension finish flush with the end of their house. The client gets a big kitchen, the previous living room becomes a dining area and the end of the house gets folding sliding doors. Very nice. 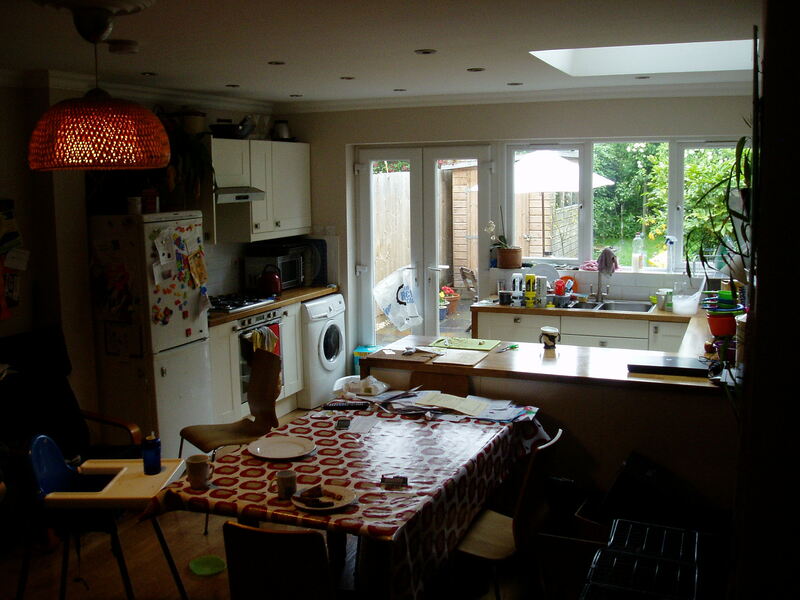 But under the old rules the side return extension could only be 3m deep and the existing kitchen was 3.7m. The extra two feet four inches was not just a spatial problem, but a structural one. To open up the space we need steel beams of modest size, but beams must be straight and must be supported at either end. If the end of the house is not in a straight line, we get not one opening but two, with a support in the middle, so the open end of the house is lost and we get two medium sized openings instead of one big one. Not the same effect at all. With the changes to PD we can now have the extra 70cms and the scheme is back in contention. Let’s see what they say, my client should be pretty happy if we get an approval. One of the additional rules for larger extensions is the neighbour consultation scheme. This obliges the council (not the applicant) to notify all adjoining owners of the proposal, in case they wish to comment. What they do with these comments I don’t know – and if you are objecting to your neighbour’s proposal for an eight metre monster your rights are is not made clear. What is shown in the guidance however is the determination period, which is six weeks, and the minimum time for objections to be registered, which is three weeks. Reading the guidance it seems that the amenity to the adjoining owners is the main consideration and that the council will determine whether this is acceptable.